With its full-frame 36x24mm CMOS sensor and fixed, high-quality Carl Zeiss 35mm f/2.0 lens the RX1 and now the modified version with its optical low pass filter (OLPF) removed, the RX1R are very attractive cameras for landscapes, architecture and reportage; anything really where portability and discrete operation are essential. The modified RX1R lacks the OLPF of the standard model promising an increase in resolution and sharpness, however unsightly moiré may be noticeable under certain conditions and may require additional steps in post-production software to reduce. 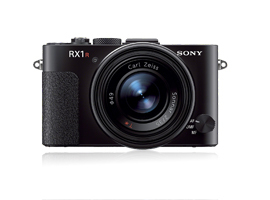 Besides the attraction of the full-frame high-resolution sensor without an OLPF, the RX1R has a highly desirable Carl Zeiss Sonnar T* 2/35 (35mm f/2.0) lens. It features eight elements in seven groups (with three aspherical elements), focuses to just 20cm and has both focus and aperture rings for manual control. 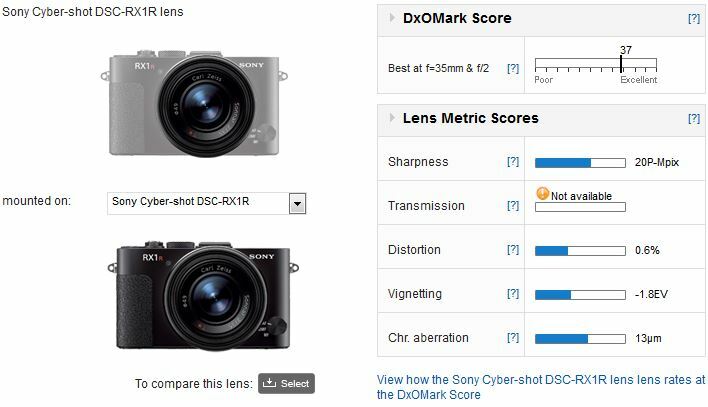 With an DxOMark Lens score of 37 points the new special edition Sony RX1R scores very highly, and ranks in 7th place overall in our database, achieving a similar score to the Sigma 35mm f/1.4 DG HSM A when mounted on the 24P-Mpix Nikon D600. As for the all-important Sharpness score it achieves a 20P-Mpix rating, which is one of the highest in our database (given the sensor’s pixel count). It is perhaps not quite as high as it could have been, though it’s likely due to sensor efficiency than the resolving power of the lens. As for other imaging characteristics the Zeiss performs very well although it’s not quite at the same level of the retro-focus Sigma. Chromatic aberration is in double figures but it’s still relatively low, while distortion, on the other hand is a little higher than expected (and noticeable in certain images). 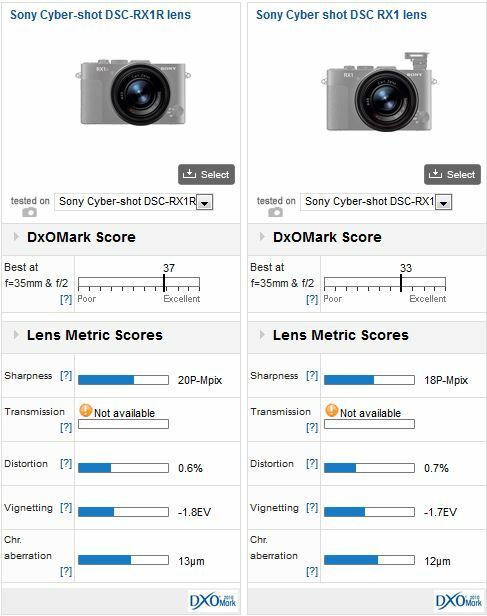 Comparing the two models side-by-side we can see that removing the OLPF has improved the DxOMark scores somewhat. Bear in mind this is single score is simply a bench-marking exercise and to see how well the lens performs we have published the results here. 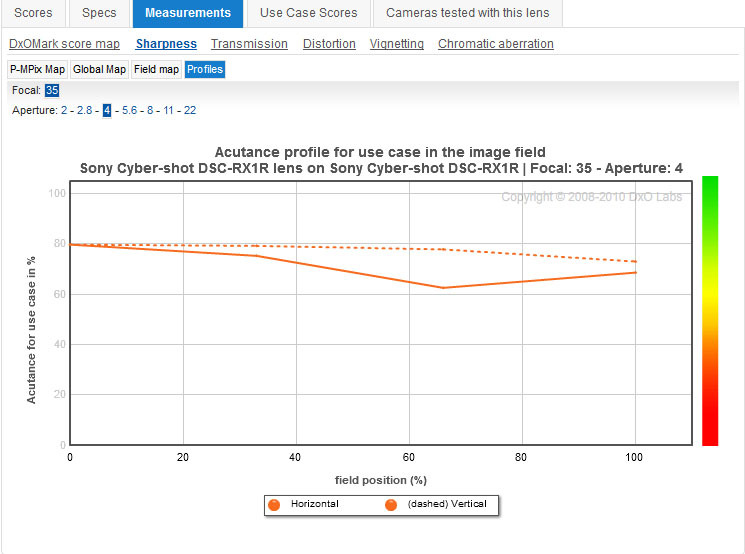 As for the other lens metrics the results are within the error of margin for testing but still likely an accurate reflection of the effects of removing the OLPF. While detected a very slight impact in sensor performance during our initial assessment (please see here), the overall effect on DR and color reproduction would be negligible in real world results. In turn the benefits of improved resolution and detail rendering are tangible, albeit only slight and really only noticeable at the wider aperture settings. Of course it may well be possible to sharpen the RX1 files to match that of the RX1R although there may also be an increase in artifacts (that is out of our remit here, please look out for an in depth review of the RX1R at our partner’s website; http://www.dpreview.com/previews/sony-cybershot-dsc-rx1r/4). Without the OLPF in place it’s likely that certain files from the RX1R will include moiré or color artifacts, depending on the subjects. Given the two are listed at the same price, it’s not an easy choice to make.